The Last Edition – the Mary Moll Building in Hollywood stands in for San Francisco. (C) 2013 Google. The San Francisco Silent Film Festival begins Thursday, July 18. I will be signing books at the festival on Sunday, July 21, following the Kings of Comedy presentation at 10:00 a.m., and before the Safety Last! screening at 8:30 p.m. I have several posts showing how Harold Lloyd filmed Safety Last!, including two HERE and HERE. 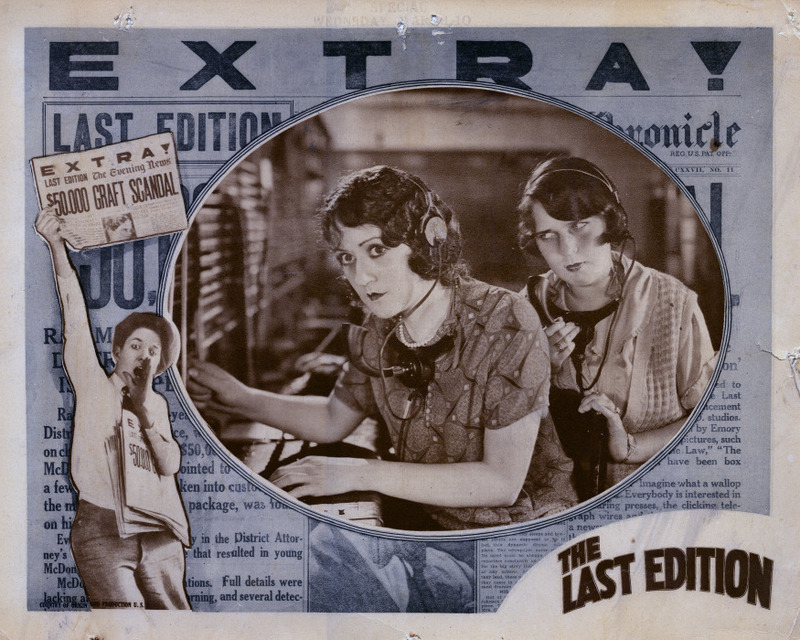 I am especially looking forward to the Sunday 3:30 p.m. screening of The Last Edition (1925), an adventure-drama filmed on location throughout San Francisco, including many scenes shot at the San Francisco Chronicle newspaper. As explained by Thomas Gladysz at his post, The Last Edition was considered lost until a unique surviving print was found in 2011 at EYE Film Instituut Nederland, and preserved by SFSFF President Rob Byrne. Filling in the blanks, I identify here three Los Angeles settings appearing in The Last Edition. The first setting, above, was filmed on Hollywood Boulevard in front of the Mary Moll Building. The automobile pictured above is parked nearly in front of where Grauman’s Chinese Theater would later be built in 1927. 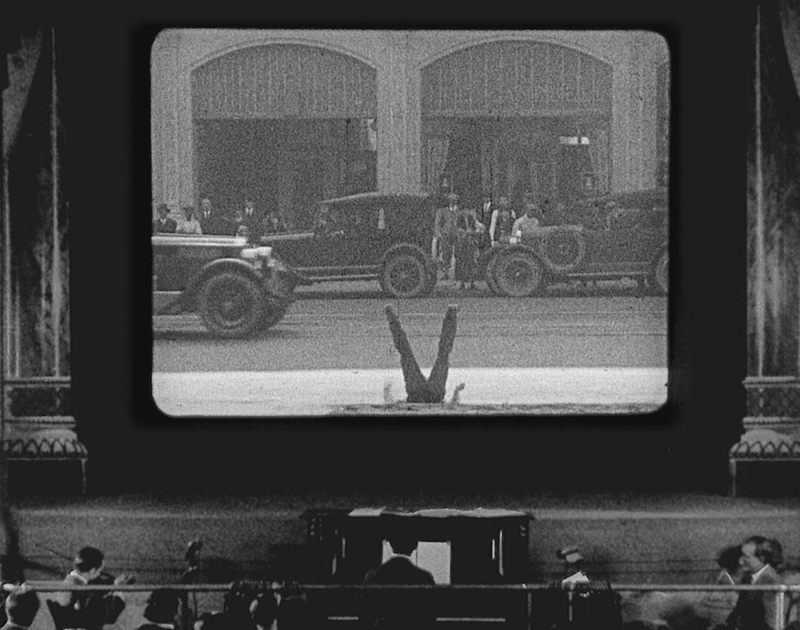 To the right, Buster Keaton falls in front of the Mary Moll Building during the movie-within-a-movie dream sequence from Sherlock Jr. (1924). The next view above looks north up Hill Street from 6th Street – the trees along the south side of Pershing Square appear to the left of the movie frame. The extant Hotel Clark (red box) at 426 S. Hill Street, and the former Boos Bros Cafeteria (yellow oval) at 510 S. Hill Street are identified. The joint fire-police station appearing in The Last Edition. Photo Tommy Dangcil. Lastly, the former joint Hollywood Fire and Police Station above, that once stood at 1625 and 1629 Cahuenga Boulevard, makes yet another silent-era film appearance. The station appeared in Buster Keaton’s feature films Three Ages (1923) and The Cameraman (1928), in Harold Lloyd’s Safety Last! (1923) and Hot Water (1924), and in the Douglas Fairbanks 1917 comedy Flirting With Fate, the 1924 Our Gang short High Society, and the 1925 Harry Langdon comedy Plain Clothes. You can read more about Keaton filming beside this fire station HERE. This entry was posted in San Francisco, The Last Edition and tagged Buster Keaton, Hollywood, Keaton Locations, Los Angeles Historic Core, San Francisco Silent Film Festival, Sherlock Jr., Silent Comedians, Silent Comedies, Silent Movie Locations, Silent Movies, Speedy, The Last Edition, then and now. Bookmark the permalink. John, lways enjoy reading your articles. When googling the “Senseless Six” I found numerous citations, mostly recent. Seems the oldest reference is to a Gaelic poem http://books.google.com/books?id=gHNiAAAAMAAJ&lpg=PA60&ots=yQYTlgS2B4&dq=%22the%20senseless%20six%22&pg=PA58#v=onepage&q=%22the%20senseless%20six%22&f=false.